Neal Mueller – Page 3 – pilot, 7 summits mountaineer, sailor, Guinness World Record Holder in rowing, and technologist. Excerpt from 100 years of Brinton, a website devoted to appreciating data visualization author Willard Brinton. I agree. 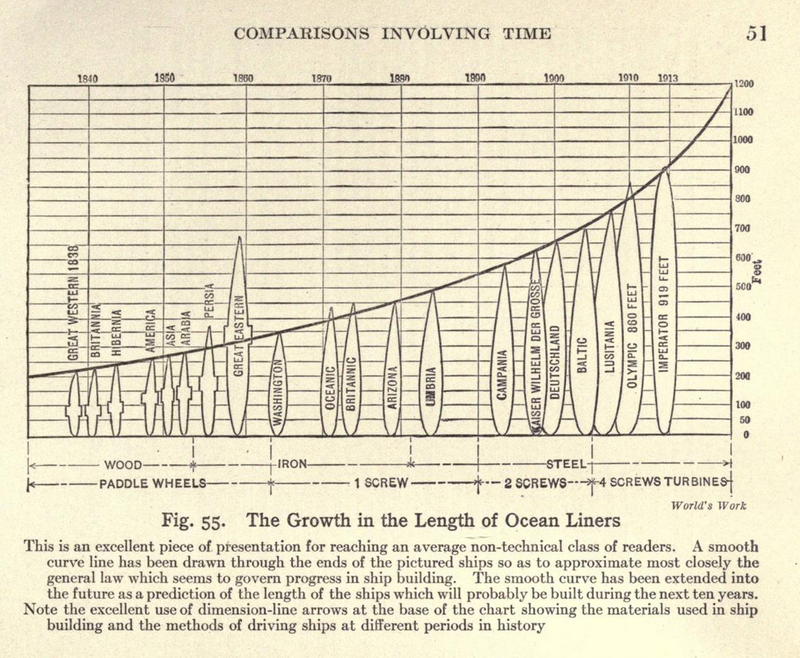 Below is an image from Brinton’s book, which is more about data visualization than about ocean liners, but I find both interesting. I agree that Brinton’s book is awesome. It’s called Graphic Methods of Presenting Facts. You can read it below, for free. 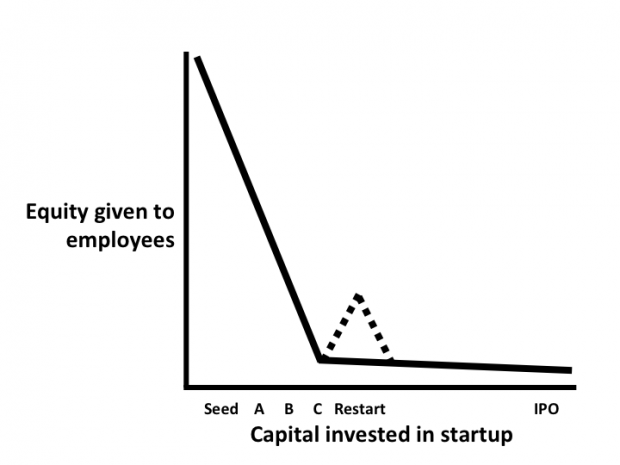 Enterprise Software – Software used by large companies is still awful and still very lucrative. Making The Expensive Cheap: Because of the cost of traditional enterprise software, many categories of solutions were previously cost prohibitive for small or even medium sized businesses to benefit from. The Next Billion Workers: Traditionally office-based knowledge workers have been the users of enterprise software. Mobile phones and tablets turn every type of employee – from the retail store associate to the field services team – into a knowledge worker. Digitizing Every Industry: Every industry is going through some form of information-based disruption; this is causing businesses to modernize their practices, leveraging new data, accelerating key processes, and delivering digitally-enabled experiences in the process. More people died on Everest this year than any other year. The cause of 16 of the 17 deaths on the mountain this year was an avalanche, that occurred between basecamp and camp 1 on 4/18/2014, in an area known as the Popcorn Field. This is around 18,000 or 19,000 feet at the top of the Khumbu Ice Fall, the most dangerous part of the Mount Everest climb. An overhanging wedge of ice the size of a Home Depot broke loose from the western shoulder of Mount Everest, killing the sherpa that were hauling loads underneath it. They didn’t stand a chance. The only way to avoid an avalanche here is to not be on this part of the mountain in the first place. How Tragic was 2014? Very. That one avalanche above basecamp made international news. It killed 13 people, making 2014 the deadliest year on the world’s deadliest mountain. The data source for the below graphs is a wikipedia page that tracks Everest fatalities. Here is the google doc I used to make the graphs. 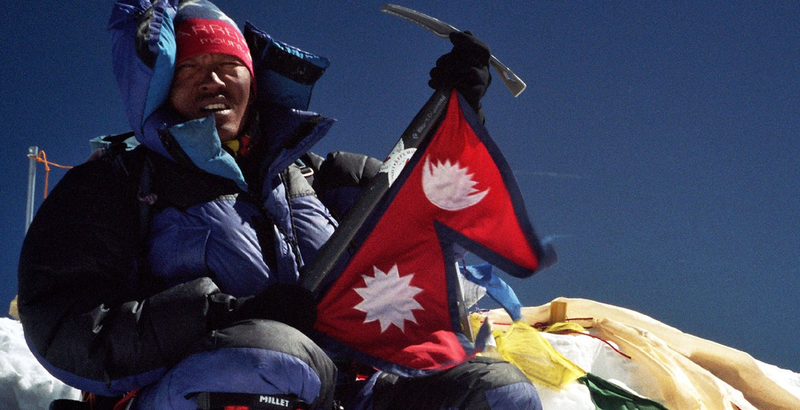 All of the deaths in 2014 were Nepalese Sherpa. This has caused a stir in the Nepalese community and among westerners (like me) who relied on the sherpa, and have therefore come to care a great deal for their well-being. The Sherpa are an indigenous ethnic group who have settled in the Khumbu, near Mount Everest. There are about 100,000 of them, and many have the last name Sherpa. For more than a century, western climbers have hired Sherpa to do the most dangerous work in the Himalaya. The deaths this year have caused everyone that has ever worked with the Sherpa people to take a moment and reflect on whether it’s worth it or not. And how we can protect the Sherpa. The Sherpa people consistently put the needs of “members” above themselves. A “member” is a person who hires the Sherpa to help them climb mountains in the Himalayas. On Everest, I was called a “member”. Internationally, the word “Sherpa” has come to describe the profession of being a porter, someone who carries objects. In other words, the Sherpa people became so revered as porters, that they redefined the professional category. To put this unto humorous contrast, that’s like Minnesota doctors becoming so great at curing disease, that all doctors worldwide come to be called “Minnesotans”, instead of doctor. Are the Sherpas Strike Demands Fair? Yes. The Sherpas were offered $400 USD and they want $1000 USD per fallen Sherpa, to defray funeral expenses. Is this fair given that Nepal is in the developing world? A dollar in the USA has much less purchasing power than a dollar in Nepal, or India – the Nepalese rupee is pegged to the Indian rupee. According to the Economist, in their easy to understand Big Mac Index, $50 USD will buy 11 Big Macs in the USA, and 30 Big Macs in Nepal. This means that a dollar in Nepal buy about three-times what it will in America. This purchasing-power-parity (PPP) math can help us determine if we feel that the Sherpas demands are fair. I believe they are fair . Funeral arrangements to transport a body from base camp down to their home village certainly adds to the funeral expense. Among other additional fees. Even though Nepal has a much higher PPP, it stands to reason that they ask for $1000 USD. This is worth about $3000 in the mind of an American, which is within the realm of perfectly reasonable for funeral arrangements, especially given the nature of this years tragedy. As an American, I am accustomed to the Federal government going out of it’s way to afford reparations to families that are hit by national disasters. For Nepal, this avalanche was absolutely a national disaster. The 13 Sherpas have impact on much more than just their own families. There is a many thousand person supply chain that these climbing Sherpa are just to tip-of-the-sword for. Given that, and with the admission that I absolutely feel that a welfare state like what we have in America is the best of all possible alternatives, I believe the Sherpas request to be fair and adequate to help Nepal cope with this national disaster. How will 2014 be Remembered? Expensive. As of 4/23/2014, more than half the Sherpa have left basecamp. No one knows if the Sherpa will return. Many of the climbers have also left. If the teams don’t return quickly (days not weeks), they will un-acclimatize, and this two-month long climbing season that ends in May will effectively be over. Without the help of the Sherpas specifically, who are key guides and also haul tons of gear up the mountain, it would be nearly impossible for climbers to scale Everest. 2014 will be remembered as a very expensive year on Everest, in terms of human life (17 dead), lost opportunity (very few summits this year by climbers), lost income (for sherpas seeking to advance a career and make-ends-meet on Everest), and lost investment (for climbers who have paid $30,000 to $90,000 each). Some of the articles I read question if it’s all worth it. In my estimation it is. I am a serial adventurer with motivations and drive that differ from the norm. I understand how many people find mountaineering needlessly risky. I look at it like this. Some people really like chocolaty sweets, and they get fat. That’s a risk. Some love football, and they get concussions. That’s a risk. Some stay safe by never leaving hermit holes, and thus go bonkers. That’s a risk. We all take risks – my risks involve ice bulges that avalanche. I’ll close with a picture of Lakpa Geljin Sherpa, who climbed with me to the top of Mount Everest at 9:00am on June 2, 2005. Here he holds the Nepalese flag lashed to his aluminum ice axe. This same axe successfully brought him to the summit of Everest for his previous two summits of Everest. He’s an elite-climber. The year that Arctic Row rowed across the Arctic Ocean we witnessed the lowest ice cap in recent history. And the trend predicts more melt to come. The Arctic, the roughly 8 percent of the earth above latitude 66º 33′ north, is warming faster than many climate scientists expected—at nearly twice the rate of the rest of the planet. 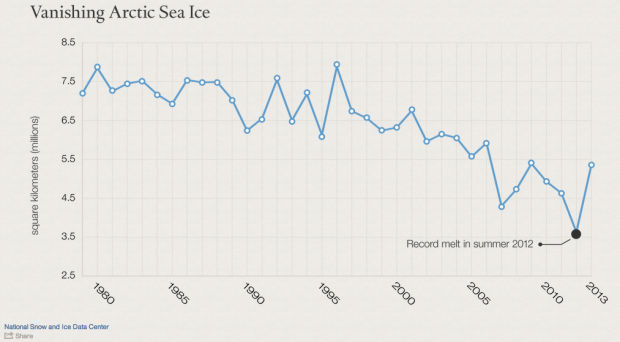 The extent of Arctic sea ice, which melts to its nadir each September, has steadily declined over the past three decades. The years 2007–2013 saw the six lowest levels since satellite imaging began in 1979. Overall, the ice cap has retreated about 40 percent over this period. The trend is likely unmatched in recent human history, reported a UN panel on climate change in 2013. You should buy an iPhone 5S because your iPhone passcode is easy to guess. The iPhone 5S has Touch ID, as an alternative to your (weak) passcode. Data from Daniel Amitay. 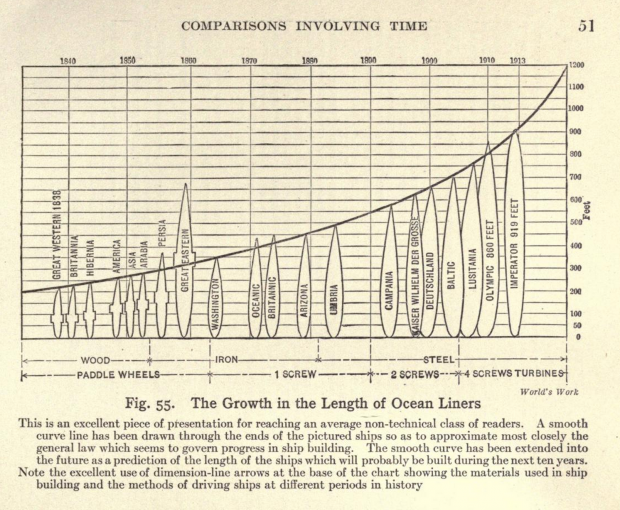 About Project Graph: At Wharton we’re taught that everything can be graphed. This is my attempt to graph my goings-on. Deliveries are moving from hours to minutes, at the cost of selection breadth. 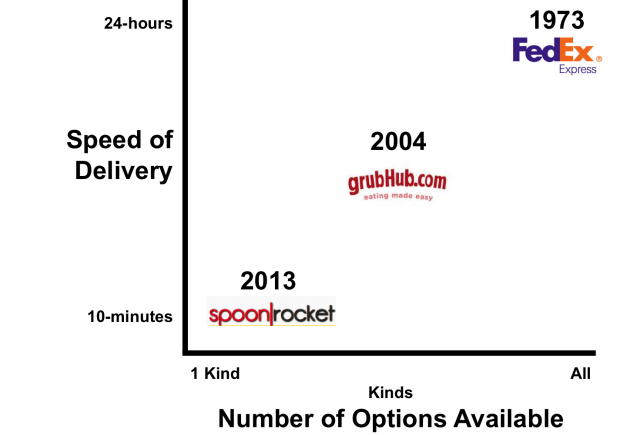 The latest incarnation of this trend is Spoonrocket, who delivers a constrained selection breadth of 1 of 2 meal options in just 10-minutes. 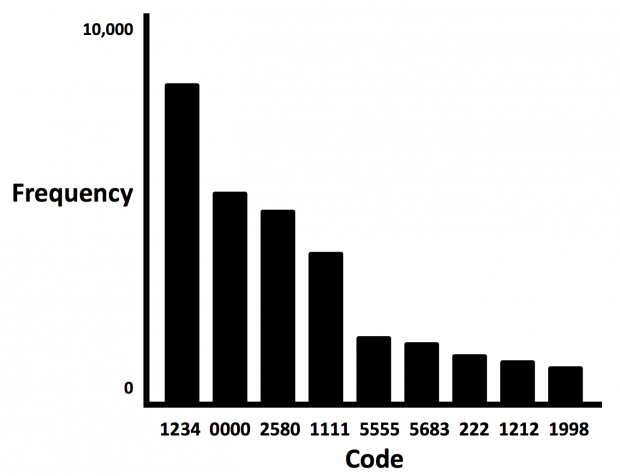 You could prepare a similar graph for the time it used to book a taxi (e.g. days for Boston Livery vs. minutes for Uber). Maybe I’ll graph that next. Do You Want New Topics or New People Everyday? There’s this tradeoff between interacting with lots of new people everyday and interacting with lots of new ideas everyday. Except operations people; they see the same problems, and same people. Every day. Update: Added Operations, which adds humor and truth, thanks to my Wharton colleague Brandon Mah. Hat tip to Brandon Mah who clued me into the Operations function and their placement. It’s funny how if you have a lot of pets, you’re a little mental, but it’s the exact opposite with teeth. 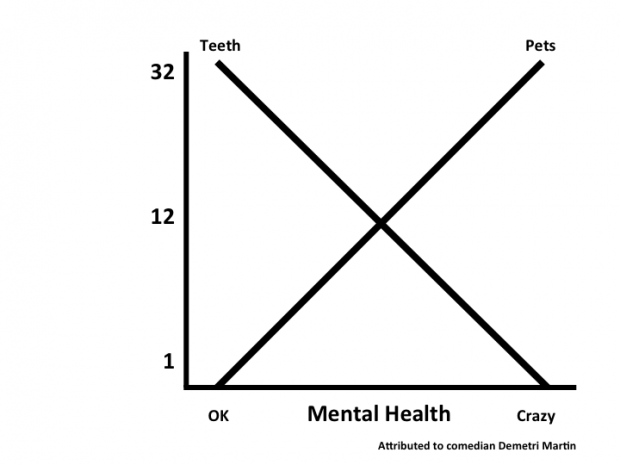 Sidenote: if you haven’t seen Demetri Martin’s visual comedy, you should avail yourself of it. This idea is taken from him. 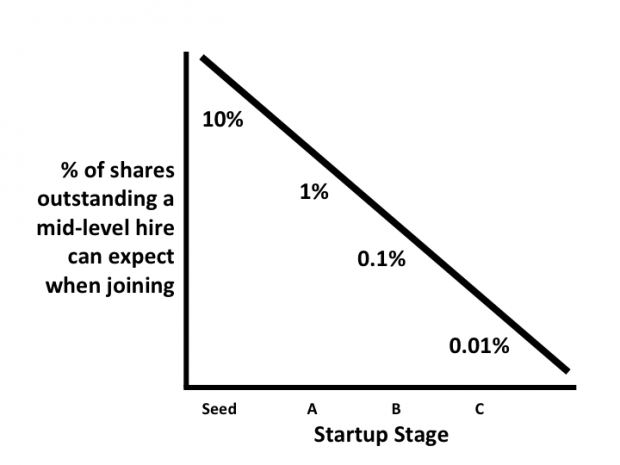 A factor of 10 is useful in predicting what percentage of a company you should allocate to new hires (if you’re the hiring manager), and what percentage you should receive in a fair negotiation (if you’re the recruit).